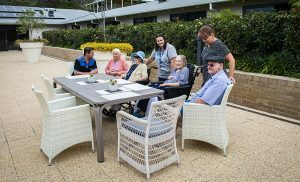 The peaceful and welcoming environment at the new Frank & Jess Kennett Home makes it a popular Aged Care choice for those in the southern Sydney area. Set within 4.7 hectares of rolling bushland amid landscaped grounds in a truly beautiful coastal location complete with ocean views. Situated below the escarpment in Stanwell Park and moments from the beach and only an hour from Sydney. 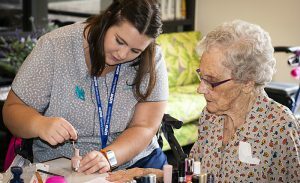 You will find professional and experienced staff who are passionate about creating a home-like environment and delivering high quality care and support services. This spacious facility offers state of the art living for 44 Residents and is beautifully styled and decorated with luxurious furnishings. We invite you to take a tour through the facility. To navigate through the tour below, please use your mouse, arrow keys or both to control movement and to also the select the floor circle you want to navigate. Common areas include spacious dining and lounge rooms where Residents and visitors can relax and chat. Welcoming courtyards are the perfect spot for an al fresco catch-up with family and friends. All of the bedrooms feature an ensuite, television, Nurse Call System and individual air conditioning. Tasty and nutritious meals are planned by our aged care specialist dietitian and prepared freshly on site by our qualified Chef. Experienced Registered Nurses are on duty 24 hours a day to provide high-level care and Podiatrists and Physiotherapists are among the allied health professionals available to residents in our facility. A comprehensive activities program includes bingo, shuffleboard, reminiscence therapy, craft, pet therapy, men’s shed, visiting entertainers who provide music and dance, weekly religious services and bus trips. Residents can relax and be pampered with weekly hair and beauty services. Kennett Home also provides a stimulating and secure environment in our Mountview Wing for Residents with Dementia. Staff are fully trained, experienced and are passionate about their work. 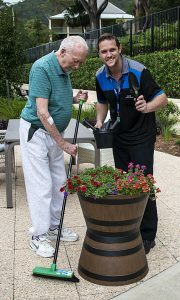 All aspects of care are thoughtfully provided here at the Frank & Jess Kennett Home. Refundable Accommodation Deposit (RAD): – this is commonly referred to as the “bond” and is determined by Centrelink and based on the assessment of your income and assets. The full RAD for Frank & Jess Kennett Home is $550,000. Contact Frank & Jess Kennett Home today to arrange a tour and let us “take care of your tomorrow”.